It’s been a long summer, and I haven’t been able to write very many free crochet patterns for you because things have been a little bit hectic. Today, I finally had some time to sit down and write up a new design. As usual, I’m not quite sure what type of flower this is. Maybe similar to a gerbera daisy? If you think it looks more like something else, I’d be happy to hear suggestions. If you’d like to make one of these flowers for yourself, here’s how! 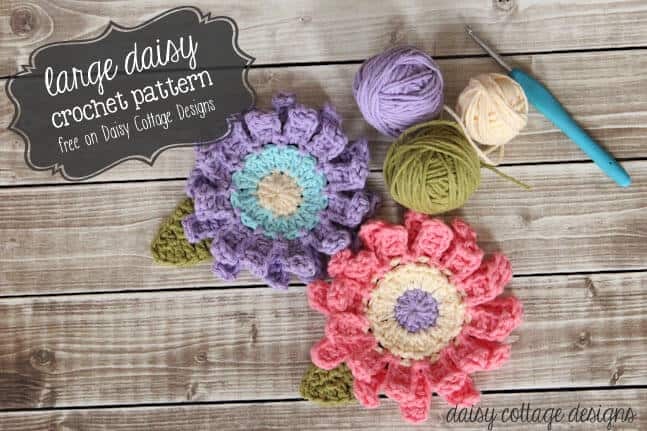 This crochet flower measures approximately 5.5″ in diameter (without the leaves). With your first color, ch 3. Round 4: Join your second color yarn with a slip stitch in any of the ch 2 spaces. Ch 6. dc in the third chain from hook, dc in the next three chains. Sl st in the same ch 2 space. *Sl st in the next ch 2 space, ch 6. dc in the third chain from hook, dc in the next three chains. Sl st in the same ch 2 space* around. You should now have your fist layer of petals (12 of them). Now it’s time to make the second layer of petals behind the first. Row 1: hdc in the second ch. dc in the next 2 chains. tr in the next 3 chains. dc in the next 2 chains. hdc in the last chain. ch 2. Don’t turn your work. You will be working the other side of the leaf now. Row 2: hdc in the first stitch (so you’ll be hdc in the base of the hdc you just made). dc in the next 2 stitches. tr in the next 3 stitches. dc in the next 2 stitches. hdc in the next. ch 2. sl st in the top of the hdc on the other side of the leaf. Cut yarn and weave ends. Great design! 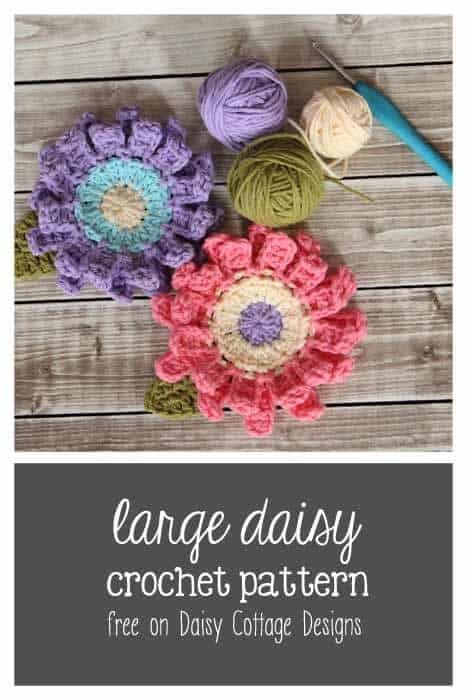 I love it and think I’ll crochet it this evening yo make brooch! can’t afford buying as many pattrns as we’d like! That’s great, Angelica! I hope you enjoy it! This is so pretty! I can’t wait to give it a try! Thanks for sharing. If you made the center all one color, either black or dark brown, and the petals yellow, it would look a lot like a sunflower. You’re not the first person to say that – it could be perfect for fall!! Thanks for this free pattern, it’s so beautiful. Thank you for sharing I love flowers. I have been looking for a large black eyed susan pattern. I think this is it!! Thank you for sharing. Perfect! I’m glad it will work for what you’ve been looking for. Do u chain 3 first like the directions say? I’m a beginner and would love to learn how to do this! Yep! Follow the directions and your flower should look like the one in the picture 🙂 You’ll work into the first chain stitch that you made. A part of me wishes I wasn’t married so I can cover every square inch of my apartment in your pretty flowers! !